This ground-breaking handbook details the present situation with regard to female genital mutilation (FGM) in Britain, referring also to other Western nations where FGM occurs. It scrutinises current pathways to eradicating this dangerous, sometimes lethal, form of child abuse and gender-related violence. The cultural and belief systems giving rise to FGM are complex. Further, FGM is an intensely intimate matter often imposed on young and vulnerable children. Approaches to its eradication therefore demand considerable human insight and a competent grasp of inter-/cross-agency working. It is also vital that everyone concerned - whether in caring and parental, safeguarding or other roles - understands fully that, regardless of custom or belief, FGM is a serious crime. The vulnerabilities and need for protection of victims and potential victims are paramount, but these pressing priorities do not lessen the requirement that all aspects of FGM be dealt with straightforwardly in accordance with the law. This book makes the case urgently for developing a shared, coherent model - a multi-disciplinary paradigm articulated at the highest level - as the basis to achieve the eradication of FGM. The text will be required reading for health, legal, educational and social services professionals, as well as researchers, policy-makers, school governors, journalists and other concerned citizens. Preface; Introduction; Demography and epidemiology of FGM; Socio-economic analysis; Perceptions and beliefs over time; Men, women and power; Clinical issues; Legislation and governance; Prevention - formal approaches; Prevention - communities; Prevention - information and education; Prevention - social services and multi-agency work; UK politics and the media; Will FGM in the UK be eradicated in a decade? ; Further reading; Multimedia resources; Organisations; Appendix; Index. 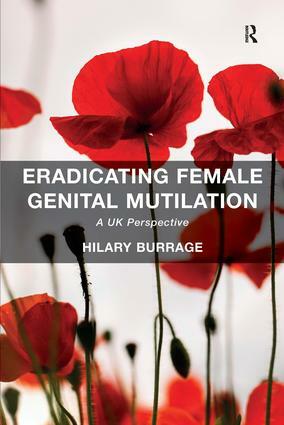 Hilary Burrage is a consultant sociologist and journalist, also advising the Guardian newspaper on FGM. Earlier in her career Hilary was a university Research Associate in community health and a college Senior Lecturer in health and social care. Community engaged, and with grounded board-level and national experience of regeneration, science, health, environmental issues, politics and culture, Hilary has worked and collaborated in many contexts, from Liverpool via London to Prague and New York. A former AFS (American Field Service) Scholar, Hilary is also a Fellow of the Royal Society of Arts.